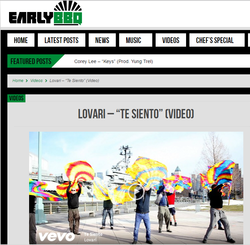 Early BBQ features "Te Siento"
EARLY BBQ features Lovari's "Te Siento"
NYC’s own Lovari makes his EarlyBBQ debut with the release of his latest visual for “Te Siento,“ a single on which he brought a new flavor of Latin R&B. Produced by Full Clip and Engineered by Robert “Giambi” Garcia. This mid tempo track is a companion to his #1 charting single “Still In Love” (currently at 1 Million streams on VEVO). Keep up with all things Lovari by following him on Twitter,Instagram, Facebook, ad by visiting his official website www.lovariofficial.com.